This publication is a result of the combined efforts of many individuals. Terrie Brown, with the Virginia Karst Project provided editing support and technical assistance. George Wills provided the illustrations. Joe Zokaites did the computer graphics. Several members of the Cave Conservancy of the Virginias helped with content selection, editing, and proofreading. Wm. K. Jones is the photographer for the cover photograph. The residents of karst areas need to be aware of how day-to-day activities affect the groundwater and fragile ecosystems in their karst regions. The Cave Conservancy of the Virginias recognized the need for information about karst resources and produced this guide. The Cave Conservancy, established in 1980, has been chartered to protect karst in Virginia and West Virginia. The Cave Conservancy has dedicated its efforts towards the conservation of the over 5,000 wild caves found in the Virginias. The Cave Conservancy has directed conservation work toward the protection of all cave resources, including habitats for endangered species, cave watersheds and springs, and important recreational caves. Education of the public about caves and cave resources is a primary goal of the Cave Conservancy. This guide is foreseen to play a major role in assisting landowners to become more aware of the significance of living in a karst environment. This guide will be helpful to homeowners, farmers, cave entrance owners, business people, and anyone who lives, works, or plays in karst areas. Additionally, the guide will be usefu to educators, developers, park managers, watershed and conservation groups. Karst is an important resource in your state. Not only does karst contain beautiful features such as fragile cave formations, it also may hold the key to the health of an entire town or city by its links to drinking water. The Cave Conservancy board and staff hope that a greater understanding of karst resources will come by reviewing this guide. Karst is defined as a landscape with topographic depressions such as sinkholes and caves, caused by underground solution of limestone bedrock. This landscape features underground streams and aquifers which supply the wells and springs that communities use for their drinking water. Karst protection requires an understanding of the watershed and the will to protect the natural resources within it. Everyone lives in a watershed. Even if a home is not next to a stream, it is in a watershed, and common everyday practices can contribute to the overall pollution entering into that water system. The hollow nature of karst terrain results in a very high pollution potential. Streams and surface runoff entering sinkholes or caves bypass natural filtration through the soil and provide direct conduits for contaminants in karst terrain. Groundwater can travel quite rapidly through these underground networks – up to several miles a day – and contaminants can be transmitted quickly to wells and springs in the vicinity. Groundwater is an important source of private and public water supplies. However, everyday activities in the source area can contaminate the groundwater on which so many people depend for everyday use. The source area is the land surface that contributes water to an aquifer. It is very important to protect these source areas from detrimental activities. A watershed is an area of land from which all water drains into a common water body. Rainfall, spring runoff, and groundwater drain from upland areas to a low point or basin, usually a larger stream, river, lake, or bay. Water enters a karst watershed through both direct and indirect means. Precipitation in the form of rain and snow, which is usually the greatest during January through May, enters the aquifer directly as surface runoff or indirectly as water seeping through the soil and bedrock. Drainage in karst watersheds tends to be three dimensional; flowing laterally across the surface, as well as vertically underground. Residents of a watershed can protect groundwater by minimizing land disturbances, soil erosion, heavy runoff of storm water, and pollutants. Groundwater is at a much higher risk where watersheds are characterized by overgrazing, high-density development, agricultural or urban runoff, and mismanaged commercial facilities sites. A land area that includes sinkholes, springs, sinking streams, and caves. Karst is defined as a landscape with sinkholes, springs, and streams that sink into subsurface caverns. The word “karst” was developed in Europe, where early geologists first studied the nature of groundwater flowing through limestone hills and valleys. Approximately 10% of the earth’s surface (and 20% of the U.S.) is composed of karst; however, approximately 25% of the world’s population lives on these areas! The hollow nature of karst terrain results in a very high pollution potential. Streams and surface runoff enter sinkholes and caves, and bypass natural filtration through soil and sediment. Groundwater can travel quite rapidly through these underground networks – up to thousands of feet, or even miles, per day – transmitting contaminants to wells and springs in the vicinity. In karst areas, the fractured limestone rock formations have been dissolved by flowing groundwater to form cavities, pipes, and conduits. Sinkholes, caves, sinking streams, and springs signal the presence of underground drainage systems in karstlands. Unless watersheds are protected, these direct connections between the surface and the subsurface can threaten the quality of our drinking water. The safest watersheds are those in which all residents understand the karst landscape and work together to reduce soil erosion, high-density development, agricultural and urban storm water runoff, overgrazing, improper waste disposal, and pollution. Between 570 million and 320 million years ago, the geographic area now occupied by the eastern United States was predominantly covered by a calm, shallow, tropical sea. The sea was populated by microscopic (and larger) organisms that lived, died, and sank to the bottom of lagoons, or were washed into deeper parts of the basin by storms. Over the eons, the deposits of calcium-rich shells and skeletons solidified into the bedrock that we call limestone (CaCO3), dolomite (CaMg(CO3)2) and gypsum (CaSO4.2H2O). These rocks are soluble in dilute acids. Water becomes slightly acidic when it takes up carbon dioxide while passing through decaying organic debris in the surface soils. The interaction of acidic water with soluble rocks such as limestone produces the characteristic landscape known as karst. During the Appalachian Orogeny, a series of mountain-building events in the central and eastern U.S., rocks were alternately buried, uplifted, faulted, folded, and fractured. The geologic stresses of mountain-building and subsequent erosion created cracks and fissures in the rock through which rainwater and groundwater entered and actively dissolved the organic limestone. Within the past 10 million years, caves, conduits, and underground drainage systems have been dissolved into this rock by moving water. Surface water and streams are captured by underground channels. These channels convey the water to springs which sustain the water flow, cool temperatures, and aquatic habitats of our rivers. How Clean is Your Well Water? Many homeowners believe that the source of their groundwater is miles away, and is naturally protected from surface activities. In reality, water quality monitoring projects in cave country have documented that water often comes directly from the immediate surface. These projects also have found unacceptable levels of bacteria and nutrients in more than half of the private water wells sampled. Groundwater pollution can originate on your property or on surrounding land, potentially resulting in unsafe drinking water supplies for both you and your neighbors. Household wells and springs can be contaminated by many common and seemingly harmless activities such as boarding or pasturing livestock; the over-application of pesticides, herbicides, or fertilizers; storing home heating oil; vehicle maintenance; and on-site sewage disposal. The best means of protecting your groundwater supply is to become familiar with the geology and hydrology of your watershed, and to work diligently with your neighbors to clean up dumps and limit potentially polluting activities in key source water areas. Most health risks associated with low-level bacterial contaminated groundwater supplies can be resolved at the tap with an individual home treatment system (normally for less than $0.15 per gallon). For rural neighborhoods or subdivisions, community well fields, or springs with permitted package treatment plants are an option. All treatment systems have associated costs and specific maintenance requirements. Proper well siting and construction is essential to keep polluted surface water out of the aquifer and to avoid drilling into caves. For the best protection immediately around the well itself, isolate the well as much as possible. Site new wells at least 200 to 1000 feet away from barns, feed lots, livestock pens, sinkholes, dumps, septic systems, fuel tanks, and other above-ground and underground sources of contamination. Fence livestock out of the spring or wellhead area. Maps developed by local cavers and water management districts can also assist in locating wells away from subsurface cave pass on a safe, reliable source of water for drinking, bathing and other needs. Your will is also valuable because it represents a large financial investment. Your family’s health depends on a safe, reliable source of water for drinking, bathing and other needs. Your well is also valuable because it represents a large financial investment. Do not spread or store fertilizer, pesticides, petroleum products, or other chemicals in the zone around the well. The wellhead area should be landscaped so that standing water cannot accumulate around the well. Never pump a new limestone well at high rates (greater than 200 gallons per minute) unless aquifer tests have been conducted by a qualified hydrogeologist. In some areas, excessive pumping of karst wells has caused ground subsidence, sinkhole collapses, and de-watering of neighboring wells and ponds. Homeowners and prospective home buyers should be aware that water well samples required for new well permits and property transactions may be collected immediately after “shock” chlorination treatment to disinfect thewell. Such samples will not reveal the actual concentration of bacteria and other constituents that may be present after the chlorine is pumped from the system. Re-testing is recommended. Abandoned wells, old hand-dug farm wells, and cisterns often represent direct connections between the surface and the karst aquifer. Abandoned wells should be properly plugged with clean rock (in the water zone) and sand-cementgrout (to the surface) to prevent runoff from migrating directly to the groundwater. No wastes or debris should ever be disposed in a well or in karst features near any well. Test domestic wells for coliform bacteria, nitrates, and other suspected compounds at least annually, and keep a record of these as a “background” for evaluating any future pollution. Also record the dates that muddinessor low water level problems occur, as well as current and previous climatic conditions. Local health departments regulate the practice of well abandonment. Well drillers are required to disinfect new wells with chlorine; attempts to use unapproved “cleansers” in this process have contaminated aquifers for great distances. Be sure your driller follows all applicable state permitguidelines for water well construction and development. Polluted and low-yielding wells can sometimes be rehabilitated by a skilled driller who can acidify the well; “seal off” a contaminated water zone with casing, packers, and grout; and re-drill the well to a cleaner water zone(if one exists). Consult with your neighbors about the depth and quality of their water wells, as well as local well drillers, the health department, and geologists before attempting to re-drill a water well. If contamination is suspected or is a threat, a specific study to map land use patterns and determine the direction and rate of groundwater movement may be necessary. The information from such studies could serve as the basis for long-term, local solutions to pollution. Contact your local health department or state environmental agency for the names of environmental consultants, non-profit organizations, universities, or watershed groups with experience in this area. Sinkholes are natural drainage points for our groundwater system, so they should never be filled. If a sinkhole is plugged, water will not drain properly, may run off onto adjacent property, and possibly may cause flooding, subsidence, erosion, and pollution. The downstream springs, caves, wells, and streams which receive water from the sinkhole should be identified. If collapsed sinkholes present a hazard to health and safety, and structures, they often can be stabilized in a way that maintains natural drainage abilities. Always contact a geologist or engineer experienced in sinkhole repair before attempting to backfill or “seal” a sinkhole. Do not locate a septic system, feed lot, animal waste lagoon, or storm water basin, near known or suspected sinkholes or caves. If sinkholes appear near such sources of bacterial contamination, use appropriate methods to prevent runoff from these areas from entering the sinkholes. Minimize unnatural or increased drainage into sinkholes. Do not apply any fertilizer, pesticides, or other chemicals within at least 100 feet of a sinkhole. Notify your contractor of the location of all sinkholes. equipment also can be a big help. Contact local cave clubs and the county litter control officer for support. County public service authorities will sometimes waive the landfill tipping fee for waste materials collected in sinkhole dump clean-ups. Contact the above agencies for help with these recommendations. How does this affect my drinking water? Contaminants entering the groundwater system through sinkholes present a significant health concern, because many wells tap water-filled cavities that are directly connected to the surface. In karstlands, groundwater usually resurfaces at spring and therefore carries the contamination into streams and rivers that also may be used as water supplies. Sinkholes are natural depressions in the landscape caused by solution and subsidence of earth materials. the surface materials collapse or are dissolved into the underground cavern or cave stream. Surface water or irrigation runoff can wash soil sediment, fertilizers, animal waste, bacteria, and agricultural chemicals into the groundwater below. In sinkholes with open or rocky bottoms, this bypasses the natural filtration and biochemical breakdown processes that occur as water percolates through the soil. If you have sinkholes or caves on your property, help prevent excessive runoff from entering groundwater by planting a vegetative barrier and/or fencing around the sinkhole. 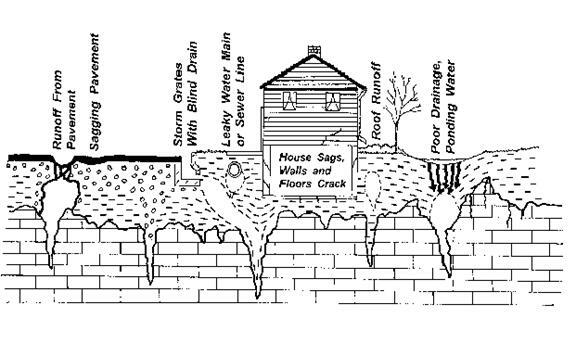 Avoid structures that divert water naturally flowing into sinkholes. Soil-lined diversion ditches often collapse when storm water erodes through to caves and underground cavities. The size and shape of the vegetated zone needed will depend on the slope of the land and the distance from the disturbed area. A 100-foot-wide grass filter strip is ideal; a 50-foot strip is still helpful; and grass strips even as narrow as 13 feet can trap enough sediment to be effective. Filter strips will remove sediment only from shallow, sheet-type flows; they are less effective in deeper, rapidly flowing water, such as in gullies or ravines. Leave a wide natural buffer of trees and under story vegetation around sinkholes and caves when clearing land, harvesting timber, or disturbing ground in the drainage area. Never dump trash, dead animals, or debris into sinkholes. This is illegal in most areas because it can directly and rapidly funnel leachate to springs and wells. Immediately after disturbing any soil, lightly fertilize, seed, and mulch the area to control erosion. A geotextile may be needed on very steep slopes. Water the area frequently until grass seed germinates. To protect embankments and channels until grass is established, build secure silt fences out of mesh plastic, anchored to the soil, and staked to hay bales. Pollution is an undesirable change in the physical, chemical, or biological characteristics of air, land, or water that adversely affects the living conditions for humans or other living organisms. Water pollution is an overabundance of one or more natural or man-made substances in a body of water. Natural pollutants from soils and bedrock include sulfur, radon, and iron deposits; tannic acid and methane gas come from marshlands. People generate a host of wastes and pollutants that must be dealt with. The U.S. Environmental Protection Agency classify the two major types of man-made pollutants as point source pollution and nonpoint sourc (NPS) pollution. Point Source Pollution comes from a single source, such as a pipe, culvert, or ditch. Point source pollution is commonly associated with industrial sites, waste and water outflow pipes, or sewage treatment facilities. The signs of pollution that most people can identify are a strong odor, discharges of multicolored liquids or foam from pipes, algal growth in streams and springs resulting from sewage and other wastes, discharges from smokestacks, and refuse dumps. Point source pollution is generally controlled through state and federal permits which require a minimum level of treatment, and filtration before wastes can be discharged to surface water. Nonpoint Source (NPS) Pollution presents a more subtle water quality problem because it originates from widely dispersed and diverse sources, not a single outlet. Natural forces such as rain or wind often play a key role in transporting NPS pollutants to streams and aquifers. Examples of NPS pollution include sediment from eroded fields and construction sites, and runoff from backyards and barnyards containing fertilizers, pesticides, and animal wastes. Other examples of NPS pollution are the disposal of waste motor oil, paint thinner, and antifreeze in ditches and storm sewers. This also includes various pollutants attached to particles that wash off streets and parking lots. NPS pollution is even draining chlorinated swimming pools into storm sewers or streams. – Soil particles eroded from the land are carried by rainwater to aquifers, streams, lakes, rivers, and bays. Metals and nutrients, such as phosphorous, attach to sediment and are carried into these water bodies by runoff. – Leaves, grass clippings, garbage, and animal waste become part of the runoff entering storm drains, sinkholes, and drainage ways, clogging the underground conduit system. – Fertilizers and animal wastes contain nutrients that are essential to life, but too much can do more harm than good. Nutrients can readily enter runoff and impact water quality. – Manmade chemicals can cause severe human and wildlife health problems. The use and disposal of synthetic organic compounds, metals, pesticides, herbicides, household chemicals, paint, solvents, petroleum products, antifreeze, battery acid, and roadway salt should be carefully controlled. Why Be Concerned about Erosion? Erosion occurs when rain or flowing water dislodges and transports soil particles, organic matter, and plant nutrients. Erosion carries away soil resources, reduces soil fertility, and produces thousands of tons of sediment that degrade water quality. Soil and sediment may convey pesticides, harmful bacteria, toxins, and nutrients into surface waters and groundwater. Flooding, habitat destruction, and subsidence increase when eroded soil and debris clog creeks, caves, sinking streams, springs, sinkholes, and drainage ways. To reduce erosion and sedimentation, karst features must be identified and receive special protection from erosion impacts. Bare soil and cracked earth in and around sinkholes, roads, and building foundations. Keep Erosion and Sediment Under Control. Any farming or planting method that utilizes the most level lay of the land and keeps plant residue on the soil surface during critical erosion periods. Any building project that disturbs the soil can create an erosion and sediment problem. In cooperation with your county Erosion and Sediment Control Administrator, proper planning and design can prevent or minimize erosion, sedimentation, flooding, and subsidence in karstlands. Stay away from active karst features such as sinking streams, sinkholes, and lands on top of caves. As soon as possible, reseed disturbed areas with temporary and/or native vegetation. Plant rigorous cuttings on bare, undercut, and eroding areas around sinkholes, springs, stream banks, and drainage ways. Maintain vegetated filter strips or grassed waterways down slope of agricultural or construction operations to slow and disperse water evenly over a large area, and to allow the natural removal of sediment, organic matter, and other pollutants carried in the runoff. Avoid rerouting waterways and drainage patterns in karst. Altering surface flows into sinkholes can cause erosion in the subsurface which results in sudden land collapse or subsidence. Ditches should be lined in areas near caves. Use silt fences to protect karst features and water resources from erosion and sedimentation until vegetation is established. Protect adjacent property and sensitive springs or streams by constructing silt fences across ditches and drainage ways. These must be inspected frequently and cleaned out after each rain event. A temporary sediment barrier consisting of a synthetic filter fabric stretched across and attached to supporting posts and entrenched. Runoff: The water from rain or melted snow that does not infiltrate the soil but flows over the land surface; precipitation drainage. Everything that goes into a storm drain, flows out into the groundwater, streams, lakes, or river. In karst areas, sinkholes are nature’s storm drains, and the dissolved caves beneath are like nature’s piping system. As groundwater moves through the earth, wide open spaces such as caves can carry thousands of gallons of water at a time. This groundwater reemerges on the surface as springs or through wells. Each time trash, motor oil, anti-freeze, litter, pet waste, fertilizer, yard and garden debris, household chemicals, and road sand and salt are dumped on the ground or washed into storm drains, drinking water, groundwater, and aquatic life are endangered. With every rain or snow these pollutants can be carried into the groundwater/surface water system. Never dump anything into a storm drain or sinkhole. Use fertilizers wisely. Have soil tested to determine proper amounts. Keep pesticide use to a minimum. Use least toxic alternatives. Maintain vegetation on steep slopes to keep soil in place. Do not overfill car radiators and fix leaks. Roof runoff contains water pollutants such as bird droppings, chemicals from roofing materials, and heavy metals leached from gutter. In an EPA study, roof runoff was one of the most toxic samples collected. Move down spouts from roof gutters so water discharges onto grassy areas away from foundations and septic systems. This will allow runoff to filter into the soil, where harmful pollutants are broken down by soil organisms. Heavy metals (lead, copper, zinc, chromium) from gasoline, tires, corroded metal, paint, wood preservatives, and motor oil. Pesticides and fertilizers from yards, foundations and gardens. Bacteria from sewage and animal wastes. Soil sediments from construction sites, bare stream banks, home landscaping, and steep exposed slopes. Prevention is the best cure. The pollution potential in karst areas is very high. Streams and surface runoff entering sinkholes and storm drains contribute to the recharge of groundwater aquifers, providing direct conduits for contaminants. Urban development and growth may cause water quality problems. Stormwater Management, erosion control strategies, and riparian zone management need to be carefully considered. The traditional methods of large-and small-scale development paid little attention to the number of impervious surfaces that were created, such as roofs, sidewalks, streets, and parking lots. Rain runs rapidly off of the surfaces, turning city streams into raging torrents that cause erosion and damage property. Rains wash toxic chemicals, bacteria, and silt from urban surfaces. Uncontrolled runoff causes sewage treatment plants to overflow directly into waterways. Fertilizers encourage the growth of slimy algae, and oil forms visible scum. Even heat is a pollutant. Runoff from hot pavement can make streams unbearably warm for creatures in the stream. Well-designed runoff controls can be smart, cost-effective, aesthetically pleasing, and for businesses, satisfy local requirements for green spaces. There are many easy and affordable ways to reduce harmful stormwater runoff, make your living or working environment more pleasant, and enhance property values, all at the same time. Maintain as large a vegetated zone as possible on drainage ways and slopes to slow runoff and filter out pollutants. Slow runoff by building check dams across ditches and using vegetated sinkholes to naturally detain water and allow soil and pollutants to settle out. Keep soil on site during construction by using silt fences, hay bales, and sedimentation basins. Reseed and mulch areas of exposed soil as soon as possible to reduce erosion. Use gravel or permeable paving materials which allow rain to penetrate the surface rather than running off directly into a stream or sinkhole. Studies conducted on a nationwide scale which included karst regions, indicate that farmland contributes to a general decline in surface water and groundwater quality. Public programs to address agricultural runoff concerns are focused on the largest commercial feed lots and dairy operations, but small, independent livestock producers and farmers also can cause problems locally (and downstream). By limiting overgrazing and restricting livestock access to streams, farmers can conserve valuable soil fertility and minimize the amount of sediment and nutrients introduced into the watershed. stabilizing problem areas during the spring and summer months in order to reduce erosion aggravated by wet, winter weather and storms. Animals should have access to shady loafing areas located away from water bodies. Don’t let the size of your herd exceed the carrying capacity of your soil and water resources. Practice rotational grazing techniques by leaving some pasture “in reserve” for livestock to graze when grass on other pastures is spent. The most heavily grazed fields may need to rest and recover occasionally in order to maintain optimum productivity. It is important to know your soils’ fertilizer requirements and other characteristics. Contact a soil scientist or the county Cooperative Extension Service representative for instructions on sampling soils for laboratory testing. drainage diversion designs, filter strips, fencing, basins, and other techniques to reduce the impacts that erosion, sedimentation, manure, and agricultural chemicals have on springs, streams, wells, marshes, lakes, and ponds. Tree roots, small stones, or rocks become exposed. Small rills, gullies, or unsightly bare soil areas develop. Soil splashes on windows and outside walls. Sediment and mud deposits collect in low areas or on lawns, sidewalks, and driveways. Even short rain events leave water flowing over the soil surface or standing in low spots. Runoff can wash sediment, fertilizers, and pesticides into surface streams and sinking streams, contributing to both surface water and groundwater pollution. Erosion removes valuable topsoil and clogs waterways, reservoirs, and spring basins with sediment. Runoff can contribute to flooding problems on adjacent properties when runoff from paved and/or eroded areas is diverted into sinkholes. 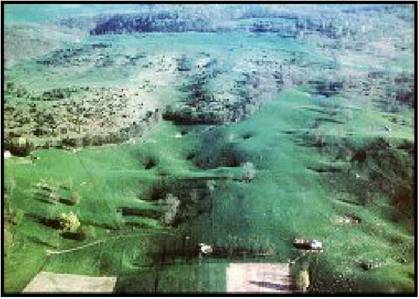 Erosion and runoff can increase the risk of sinkhole collapse in karst areas. Landscaping with grasses and ground covers not only adds beauty and value to your property, but also helps control erosion by reducing the amount and speed of runoff. Landscape yards to minimize rainwater run-off. Preserve surrounding trees and vegetation to the extent possible. Steep slopes can easily be eroded and, even if erosion is controlled, may allow water to collect in undesirable areas, such as near house foundations and around wells. Plan ahead to avoid drainage and erosion problems, and minimize ground disturbance, and plant a vigorous ground cover to reduce erosion and increase water penetration into the soil on the slope. Pesticides – insecticides, herbicides, rodenticide, and fungicides – are chemicals widely used by farmers, foresters, exterminators, and homeowners to kill harmful insects and weeds, to increase crop and timber harvests,and to prevent the spread of plant, animal, and human parasites and diseases. Although targeted at pests, certain pesticides inadvertently can harm nontarget organisms – stream insects, fish, wildlife, domestic animals, and humans. Pesticides can also contaminate the groundwater if not handled carefully. Pesticides can reach groundwater very quickly in karst areas due to the porous rock, sinkholes, springs, and caves. 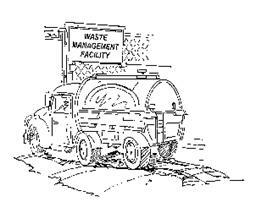 procedures are followed or pesticide wastes are properly disposed. Understanding the soils on your lawn, garden, or farm and developing natural and appropriate chemical strategies can keep chemicals from leaching into your groundwater. Soil types vary widely within short distances, so several samples should be collected and analyzed in order to fully characterize the soils. Contact your county Cooperative Extension Agent for information on soil sampling and analytical services. The correct use of pesticides and herbicides, and reducing the amount of pesticides and herbicides used can create a cost savings for the landowners. protect crops from weeds, insects, or diseases. and wash hands immediately after application. Apply only the amount specified on the product label and only on the plants and areas listed in the instructions. Never store, mix, or apply near wells, streams, sinkholes, ponds, or marshes. Maintain buffer zones around these areas. Avoid back-siphoning from sprayer equipment into wells by always keeping the discharge end of fill hoses above the tank’s water level. Before disposing of chemical containers, triple rinse or pressure rinse them and place the liquid rinsate into the spray tank to make up the final spray mixture. Prevent spills from reaching groundwater by using a mix pad with low walls to contain spills and overfills. Don’t apply if rain is forecast, unless specified on the label (some pesticides do need to be watered after application). Dispose of containers and leftover pesticides according to label directions. Store all pesticides away from the reach of children. Use a “water only” nurse tank in the field – away from water sources and sinkholes – to provide water for mixing agricultural chemicals. and state drinking water standards have been found in the majority of wells and springs tested in some karst areas. to a loss of beneficial oxygen in aquatic habitats and water supplies. get an estimate of the soil thickness or depth to bedrock across the site by using a soil probe or similar device. When mowing, cut 1/3 of the height of the grass blade. Leave clippings on the yard as a natural fertilizer and mulch. BMPs – Best Management Practices should be the basis for determining fertilizer and nutrient practices. Follow the directions on the fertilizer label. Apply the correct amount – too much can damage fragile plant roots and groundwater. Apply fertilizer based on realistic yield or growth expectations of the crop to be grown. Monitor nutrient levels of soil and plant tissue, as well as irrigation water, and springs or well water. Determine and credit the contribution of non-commercial fertilizer nutrients from legumes, manure, and compost. Identify the appropriate timing and application methods for fertilizer to reduce runoff and leaching losses. Properly calibrate and operate fertilizer application equipment. Evaluate field limitations based on environmental hazards such as sinkholes, highly erodible soils, shallow aquifers, shallow depth to bedrock, and nearby surface waters. Consider soil moisture conditions, particularly if applying liquid fertilizer through an irrigation system (fertigation), and closely watch impending weather conditions. How’s Your Septic System Doing? To most of us, septic systems are ” out-of-sight” and “out-of-mind.” Homeowners do not often realize that proper operation and maintenance of septic systems can have a significant impact on how well the systems work and how long they last. In most communities, septic system maintenance is the sole responsibility of the homeowner. When a septic system fails, inadequately treated sewage can reach the groundwater. Bacteria and viruses from human waste can cause serious diseases including dysentery, hepatitis, and typhoid fever. Many outbreaks of these and other diseases have been traced back to contaminated drinking water. Nitrate and phosphate from domestic wastewater can cause excessive algae growth in springs and streams and impair aquatic life. Nitrate is also the cause of methemoglobinemia, or blue baby syndrome, a condition that prevents the normal uptake of oxygen in the blood of young babies. Conventional septic systems should not be located near sinkholes, caves, or springs. Thin soils, sloping topography, and unstable foundations are common karstland features that affect the performance of on-site wastewater systems. maintenance practiced community wide. This can be accomplished through education, incentives, or local ordinances. the beneficial bacteria that break down wastes, and can contaminate groundwater. It is important to protect your septic system from damage. Don’t plant anything but grass near your septic systems? Roots from shrubs and trees can damage the tank and lines, and/or become conduits for partially treated sewage to flow downward to the water table. Prevent vehicles from parking on, or driving across, any part of the system to protect tank connections and plastic or tile distribution lines. Increasing the contact time between wastewater and soils. Equalizing the dispersion of wastewater throughout the drain field (for less channeling). Maximizing the natural adsorption and filtration properties of the soil. Work with the local health department and extension service to select the best system for your site. As stewards of the nation’s forest lands and the waters flowing from them, forest landowners have a special responsibility to protect our natural resources. The Federal Clean Water Act of 1987 requires that proper steps be taken to prevent pollution. Pollution resulting from soil erosion can be controlled by using Best Management Practices (BMPs). Best Management Practices, (BMPs) are any practical, and usually inexpensive, measures used to reduce water pollution. Water originating from undisturbed forest land is virtually unpolluted. Land disturbing activities during harvesting and other forestry practices can cause pollution if BMPs are not used. Most states do not regulate timber harvests on private land; therefore, it is up to the landowner to ensure that BMPs are properly installed and maintained. BMPs and pre-harvest planning are especially important in karst terrains. For specific information on constructing and maintaining BMPs, refer to the LOGGERS BMP HANDBOOK available from your state forestry departments. Pre-Harvesting Planning should be done to determine which BMPs are needed. Proper location and construction of roads, skid trails, and log landings will prevent most erosion problems. Consult a qualified professional who understands karst. The forestry consultant should prepare a Forest Management Plan in detail before work begins, which will describe any recommended BMPs. Roads, Skid Trails, and Landings should be located away from streams, springs, and karst drainage ways. Water should be diverted off roads by turn-out ditches, broad-base dips, culvert pipes, or other accepted practices. Stream Crossings should be made with temporary bridges or culvert pipes. Fords are sometimes acceptable if the stream bottom is rock and the banks are stable. Stream Side or Spring Management Zone (SMZ) is an unharvested area a minimum of 50 feet wide on each side of any stream channel or spring. Across the rest of the site, timber should be selectively harvested in a way that will leave the forest floor undisturbed. The SMZ will filter out most sediment and nutrient runoff from disturbed areas and protect stream or spring quality. The buffer zone also will prevent soil compaction by heavy equipment which can reduce infiltration and groundwater recharge. Wildlife Benefits – Stream side or spring management zones protect water quality and temperature important to fish and aquatic life. The buffers also preserve travel lanes and habitat diversity important to all wildlife. Roads and trails can be seeded with native plant species which provide wildlife food and cover. Stabilizing Disturbed Areas immediately after the cutting is complete will reduce erosion which could continue for several years. Any bare soil with a slope greater than 5 percent or which is subject to erosion should be limed, fertilized, seeded, and covered to prevent soil from washing away. Native plants that also enhance wildlife habitat should be selected. Horse Logging is becoming more popular with landowners as a low-impact method of selectively harvesting timber on steep or sensitive terrains. Small horse logging businesses exist in many rural areas. Call your local Department of Forestry or small business development center for more information. Best Management Practices can easily be destroyed if they are not protected and maintained until the disturbed land has healed. After loggers have left the site, the landowner is usually responsible for maintaining BMPs. Cost-share programs are available to help pay a portion of the cost of most reforestation and restoration work. Traffic should be restricted in the logged area, especially during wet weather. Old haul roads should be blocked to prevent unauthorized access by 4-wheelers, but maintained so that water can drain from the road surface. The drainage ditches and culverts should be kept open. Berms, silt fences, ponds, and other structures to slow water flow should be checked and repaired regularly. Waste wood debris, or slash, left on the site will also catch sediment and slow runoff velocity. Slash should not be deposited or dumped into cave entrances or sinkholes; however, as this can damage habitat, recreational values, water quality, and normal karst drainage processes. For further information, contact your state Department of Forestry. Many household wastes can be recycled. Aluminum cans and foil, glass, paper, scrap metal, and old appliances can all be recycled. These items can be recycled at recycling centers. Another option is to give items to be recycled to charitable organizations which often collect recyclables to raise funds. Approximately 300 million gallons of used oil are produced each year by people changing their own motor oil. Improper disposal of used oil wastes valuable energy and can be hazardous to public health and the environment. On surface water, one pint of oil can spread into a one-acre slick, suffocate plants and wildlife, and contaminate drinking water. Oil dumped on the ground into sinkholes or into landfills may pollute surrounding wells and springs. Recycling is by far the safest and most economical method for disposing of used oil. Simply drain your oil into a closeable container and take it to a local service station or oil collection center. Used oil is collected from service stations and garages by licensed oil processors and refined for reuse as an economical industrial fuel. In the fall and spring, a significant portion of municipal solid waste is made up of leaves and yard waste. When this material is composted, or allowed to decompose naturally, it produces a valuable soil conditioner and conserves landfill space. Many common household consumer products have characteristics which make them “hazardous,” meaning they are poisonous, flammable, explosive, or corrosive. Such products as pesticides, wood stains, polishes, paint thinners and strippers, antifreeze, and batteries have been linked to serious health and environmental problems. What can we do with these materials? First of all, each of us must accept responsibility for the safe use and disposal of household products. We can reduce the quantity of hazardous chemicals we use by becoming informed consumers. Read the label carefully before purchasing the material. Buy only what is needed for the job. Use up the product or give it to someone who can. Communities across the country have successfully organized “Household Hazardous Waste Collection Days.” Residents bring unused products to a central location where specially trained workers separate the recyclables and carefully pack the non-recyclables. A licensed hazardous waste hauler transports the materials to an appropriate disposal facility. The act of keeping from being damaged, lost, or wasted. Water conservation can lead to substantial savings in sewer, energy, and water bills. For homeowners with septic systems, conserving water reduces wear and tear on the system, and less energy is required for pumping well water. The amount of water now available on the planet earth is basically the same as it has been for millions of years. The average household uses 250 gallons of this water every day. Consumption could be decreased by 15-20% without major discomfort or expense. Conservative water use habits should be encouraged and promoted throughout your watershed. Much of the earth’s fresh water is unusable due to pollution. Water exists on earth in finite quantities. When it is polluted or wasted, “new” water to replenish our supplies cannot be created. Encourage local government to make water system and water quality improvements a high priority. Encourage environmentally compatible development over wasteful land uses in the community. Learn to recognize existing and potential water quality problems in streams and springs. Bring water quality problems to the attention of the proper government officials Participate in a stream or sinkhole cleanup program. Use low-flow faucets and shower heads, reduced-flow toilet flushing equipment, and water saving appliances. Take short showers instead of full-tub baths. Avoid letting faucets run unnecessarily. Fully load dish and clothes washers. Water lawns during the coolest part of the day to avoid evaporation. Do not over-water. Use slow watering techniques such as trickle irrigation or a soaker hose. Twenty-two states (including Virginia and West Virginia), Puerto Rico, and the Cherokee Nation currently have laws pertaining to the protection of caves. These laws cover a variety of topics ranging from definitions, protections of features, permits for excavation and scientific investigation, vandalism, and liability. Most state cave laws state that it is illegal to remove or damage anything from a cave, including rocks, formations, animals, or organisms. For further information on state cave laws, technical services, and management assistance contact your state natural resource management and conservation agencies. Many organizations are dedicated to caving and cave conservation. The Virginia Cave Protection Act provides for an advisory Cave Board. The Virginia Cave Board is administered by the Department of Conservation and Recreation and is active in environmental education and conservation of caves and karst. Please contact the Virginia Department of Conservation and Recreation for further information. The CCV is dedicated to the conservation of wild caves, caverns, and karst areas in the Virginia and West Virginia area. Please contact: Cave Conservancy of the Virginias, P.O. Box 7067, Richmond, Va. 23221. The Virginia and West Virginia Chapters of The Nature Conservancy maintain a cave registry program to encourage landowners to protect, voluntarily, the important caves or karst features on their land. The registry recognizes the value and beauty of these privately owned caves and honors those owners who volunteer to protect them. For more information, contact The Nature Conservancy Field Office in your state. The Nature Conservancy is a national conservation organization committed to preserving natural diversity. The Conservancy is a private, nonprofit group with field offices in all 50 states. The Nature Conservancy Virginia Chapter, 1233-A Cedars Ct., Charlottesville, VA 22908. (804-295-6106). The Nature Conservancy West Virginia Chapter, 723 Kanawha Blvd. East, Suite 500, Charleston, WV 25301. (304-345-4350). The NSS is a nationwide nonprofit organization dedicated to the study, exploration, and conservation of caves and karst environments. For more information, contact: The NSS, 2813 Cave Ave., Huntsville, AL 35810. The ACCA provides educational programs to increase understanding of pollution problems and their solutions in karstlands. Please contact David Foster, ACCA, P.O. Box 409, Horse Cave, KY 42749, for further information. Caves can contain unique and fragile archaeological, historical, paleontolo-gical, biological, geological, hydrological and economic resources. Each of these aspects can require specialized management and protection techniques. As a landowner in a karst region, you may know that your property could be an important piece of a much larger underground drainage puzzle. If your land has a cave entrance, you are the caretaker of a very special natural resource. Caves and the karst environment surrounding them are hydrologically connected (through groundwater and surface water) and may contain unusual or rare species of plants or animals. Protecting the cave and karst environment is the only way to ensure good groundwater quality in your area. Landowners have several voluntary options available to help conserve these fragile environments for future generations. A landowner may have the opportunity to “register” a significant cave with a conservation organization. The registry agreement is not a legal document, but merely the owner’s written acknowledgment of the significance of the cave, and an expression of willingness to protect the site. The landowner usually receives a commemorative plaque or photo for being a registry participant. period. The landowner may turn over management responsibilities to a conservation group but retains ownership of the entire property. A conservation easement can be offered to a landowner by a conservation organization to limit certain uses of the property. Easements are very flexible and may be tailored to meet the individual circumstances. An easement is a permanent restriction on the use of the property and is recorded with the land records held by the county registrar of deeds or titles. By granting a conservation easement, a landowner is giving up unused property rights of some economic value, and may be able to claim a charitable contribution on federal tax returns and reduce capital gains, local real estate, and inheritance taxes. A landowner may have the option of selling a portion of his/her property to a conservation organization in the business of preserving, protecting, and owning preserves. There are many ways in which an owner can sell all or part of his/her property. Some of these options may allow a tax deduction; others may allow the owner life-long rights to remain a resident on the property. Government agencies and public and private organizations can help share the cost of some karst management or karst protection programs. The concept that a property owner’s “rights” to develop a site can be voluntarily given up or sold to a local jurisdiction is being tested in some rapidly growing parts of the country. The City of Virginia Beach, VA, for example, is seeking to protect valuable wetlands, farmland, and water quality by offering a financial solution to farmers challenged by rising land values, taxes, and urban sprawl. Contact your regional planning commission to find out if these types of programs are offered in your area. Aley, T., 1989. Land Use and Protection of Water Quality in Karst Areas. Course Manual: Practical Karst Hydrogeology with Emphasis on Groundwater Monitoring, November 27 – December 1, Springfield, MO. Alliance For A Clean Rural Environment. ACRE Fact Sheets. Kansas City, MO. American Cave Conservation Association. Spring-Fall 1995. An Evaluation of State Cave Laws, American Caves. American Cave Conservation Association, 1995. What Goes Down Comes Back Up Sinkholes: Nature’s Storm Drains. American Cave Adventures. American Farm Bureau Federation. Protecting Our Groundwater, A Grower’s Guide. Bullard, Loring, 1995. Is Your Water Well? American Cave Adventures, American Cave Conservation Association. Driscoll, F. G., 1986. Groundwater and Wells, Johnson Filtration Systems, Inc., St. Paul, MN, 1089 pp. Mann, Julie E., Shiller, Paige Alyson. Citizens Water Quality Handbook. Northern Virginia Soil and Water Conservation District. National Small Flows Clearinghouse, Summer 1995. Septic Systems – A Practical Alternative for Small Communities, Pipeline, Vol. 6, No. 3. National Small Flows Clearinghouse, Fall 1995. Maintaining Your Septic System – A Guide for Homeowners. Pipeline, Vol. 6, No. 4. Nickinson, Pat, 1986. Sandcastle Moats and Petunia Bed Holes, A Book About Groundwater. Virginia Water Resources Research Center. Shenandoah County Water Resources Steering Committee. Protecting Your Drinking Water. United States Department of Agriculture Soil Conservation Service. Water Quality and Quantity for the 90’s, Fact Sheets. Virginia Cooperative Extension. Reducing Erosion and Runoff Virginia Gardener. Virginia Cooperative Extension, Virginia Polytechnic Institute and State University, 1995. Virginia Farmstead Assessment System. Virginia Department of Forestry. The Forest Landowner and Water Quality. Virginia Department of Health, Division of Sanitarian Services, 1500 E. Main Street, Richmond, VA 23219. Virginia Department of Health, Division of Water Supply, 1500 E. Main Street, Richmond, VA 23219. Watershed Committee of the Ozarks. How to Protect Your Well. Watershed Committee of the Ozarks. Quality Development and Stormwater Runoff. Watershed Committee of the Ozarks. Sinkholes – Inlets For the Underground Water System. Watershed Committee of the Ozarks. Water Protection At Home. Weigmann, Diana L., and Kroehler, Carolyn J. Threats to Virginia’s Groundwater. Virginia Water Resources Center. This material is not to be sold. “Living on Karst” is distributed, in association with the Cave Conservancy Foundation, by the Cave Conservancy of the Virginias for the purpose of public education. The contents are intended to be of general education in nature and should not be considered as technical advice or direction for correcting existing problems. Where appropriate, technical consultation should be obtained. Distribution of “Living on Karst” outside of Virginia and West Virginia is with the support of the Cave Conservancy Foundation. © Cave Conservancy of the Virginias 2000. All Rights Reserved. All Proprietary rights are reserved by the photographers.